Our last Eat Your Beer article featured a delicious, artery-clogging smorgasbord of stout macaroni and cheese and beer-braised chicken, I thought you might appreciate something on the lighter side. I bring to you our Drunken Cobb Salad! This salad is similar to an old school Cobb salad except that we’ve infused beer into a handful of toppings . I challenge you to find a way to add more beer without pouring a cold one over top (that would be kind of gross, please don’t try it). I trust if you’re reading this you have some basic knowledge of how to assemble a salad, so I’m just giving you the rundown on ingredients below. Amounts don’t matter much so add as much or as little of any ingredient as you like. 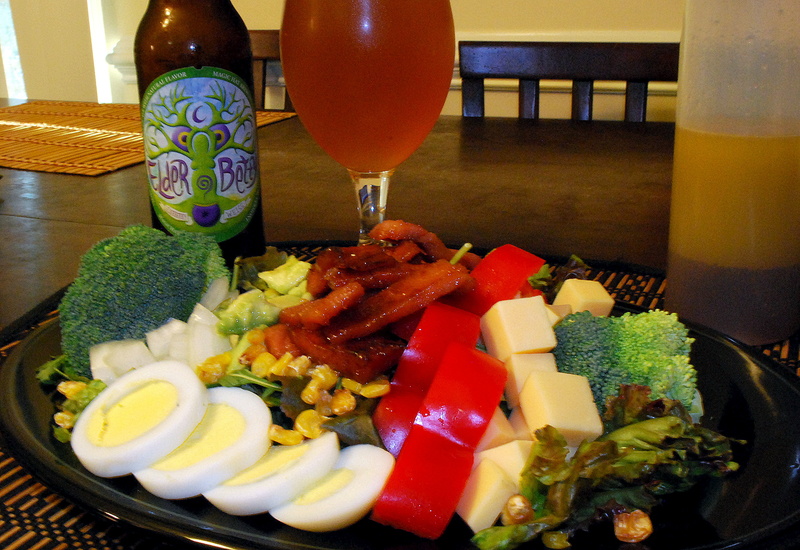 Chopped lettuce; chopped red and green peppers; chopped red onion; broccoli florets; roasted corn; sliced avocado; smoked Gouda; beer tie-dyed boiled eggs; beer and honey glazed ham; and malt vinegar dressing. Start boiling eggs in regular water. After the water boils, turn off the heat, cover the pot, and let sit for eight minutes before removing from the water. Next, crack the shells lightly without breaking them apart completely. Add a dark, flavorful beer to the pot of water. put the eggs back in the pot, and return it to a boil bring it to a boil again. Once it does, shut off the heat again and time the eggs for 4 more minutes. Remove the eggs from the water, chill them well, and carefully remove the shells. Slice them up nicely for the salad. First, make the beer honey by adding a bottle of beer – I used Magic Hat’s Elder Betty – and a mixture of a few tablespoons each of brown sugar and honey into a small saucepan. Turn on the heat to low and bring the contents to a simmer, stirring well. Once the beer has thickened to a honey-like consistency, it is done. The heating must be done slowly so as to not scorch the beer honey. Once the beer honey is ready, simply slather it on some sliced or chunked ham, and heat it up to solidify the glaze on the ham. It couldn’t get more simple: combine equal amounts of malt vinegar and extra virgin olive oil, throwing in a pinch of fresh ground pepper and salt, then shake or whisk them until they join together nicely. Top the salad with the dressing. As an added touch, we had this salad with a glass of Elder Betty, just to pair up the flavors of the beer with the beer honey ham. The salad was delicious, and our friends enjoyed it immensely. I you give this one a try, let us know what you think of it as well.